Kicking World Hot Prospect Cooper Garcia wins the Arizona State University Football Punting Competition today in Tempe, AZ. Congratulations to Kicking World Hot Prospect Cooper Garcia on winning the Arizona State University Football Punting Competition today at Sun Devil Stadium in Tempe, AZ. Cooper bested 40+ other kickers & punters in the 105+ degree Arizona heat to win the Punt Competition. We are proud of you Cooper! 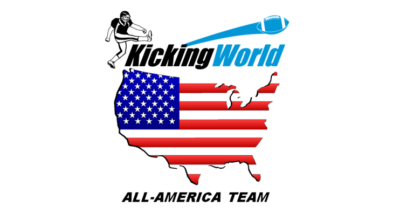 Cooper Garcia is a Class of 2015 Kicker/Punter out of Nordhoff HS in California. He has trained with Coach Brent and Kicking World for the last 3 years. He’s one of the top Class of 2015 specialists in the country.